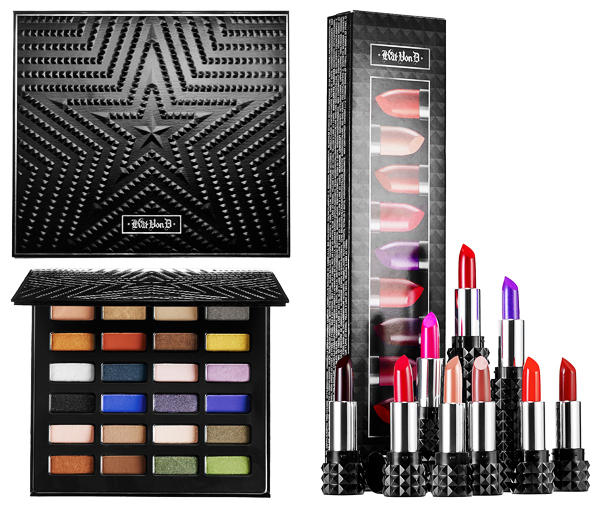 Limited Edition Kat Von D Star Studded Eyeshadow Book & Studded Kiss Lipstick Set For Holiday 2014 | Top Beauty Blog in the Philippines covering Makeup Reviews, Swatches, Skincare and More! Kat Von D Star Studded Eyeshadow Book ($55.00) - An expansive, limited-edition book of eye shadows with 24 vivid shades arranged into six quad color stories to help create a variety of eye looks. Play up eyes when you create a unique variety of coordinating eyes looks this season with this set of 24 shades. From everyday nudes to vivid brights in an array of matte, pearl, shimmer, and iridescent finishes, each color is expertly arranged into six quad stories for effortless application. Infused with a patented formulation and triple jet-milled powder, each shadow offers luxurious texture and effortless, color-packed pigment in one sweep — and they’re formulated with rose extract and vitamins A, C, and E to keep eyelids hydrated and protected. This eye shadow set makes the ultimate gift for the makeup lover in your life to experiment with countless eye looks, and to experience stay-put, smudge-free, and crease-free color this holiday season. Kat Von D Studded Kiss Lipstick Set ($39.00) - A stunning, limited-edition set with nine mini Studded Kiss Lipsticks that comfortably coat lips with bold color for 10 hours. This collection of stunning hybrid lipsticks makes the perfect gift for anyone who wants to explore and enhance lip looks this holiday season. Formulated with Color Cushion Technology, these lip colors offer incredible 10-hour wear, bold one-swipe application, and enticing velvet-touch comfort that leaves lips feeling supple. Featuring a spectrum of artfully crafted shades that each carry daring color: four bold reds, three statement pops of color, and two everyday classic shades—in a wide range of matte, shimmer, and metallic finishes. Each lipstick is infused with a high-quality formula, including a powerful antioxidant complex of vitamins A, C, and E, and each one offers a hint of uplifting cream brûlée fragrance. This set comes housed in an edgy-chic, black monochromatic casing designed after Kat's own studded bracelet — made to look as rock 'n' roll as the woman who wears it. I want all that makeup especially the palette. The lipstick set look stunning! I like the eyeshadow palette, i could use all the colors. Muito lindo like amei, que cores maravilhosas. these lipstick are so pretty!!! wooow! i want it!! make up & kat von d! this is perfection! !